Just click on a picture to see the next image. If the picture is clear, it's probably taken by Chris Grossman. Wayno. One of the best bug hunters ever. Note that I usually refer to lobster as bugs. I think that that is far better than calling them large saltwater cockroaches. 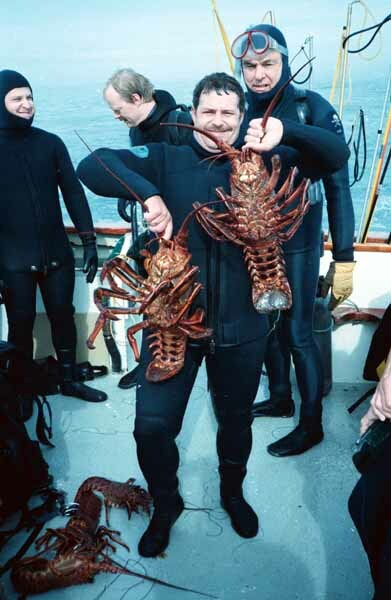 I was once asked why I like lobster diving so much. I had to think about it for a while. Explaining or describing the excitement and fun of the sport is difficult, but you can be sure that I would come up with some description to give you a picture. Think about a gigantic, very cold building, full of rooms filled with clutter, strewn furniture, hardware, machines, plants, holes through the walls and a couple of rats. Now lobster hunting is just like running in and out of these rooms, looking for rats to grab. You gotta be quick and really run through this building. You have to try to surprise them, but they are wary. It can even be more fun doing it at night with a flashlight. If you can run fast enough, you might even be able to keep warm. If you get really lucky, you can grab hold of a really big rat. I hope this explains why we like lobster hunting so much.